For the Japan supporters who were able to book a ride home with the National Team on their chartered flight, a neat little surprise awaited. First, an appearance by Alberto Zaccheroni and captain Makoto Hasebe with words of thanks to the supporters who flew Down Under to show their support. Then the entire squad filed into the aisles to show their appreciation. It was the eve of Keisuke Honda's 26th Birthday, and the fans serenaded him with a chorus of the Happy Birthday song. Back in their section of the plane, the squad on a whim decided to open a bottle of bubbly and celebrate the Birthday boy. They arrived in Japan safely. Following their arrival home, Kazu Miura asked Hasebe to help organize a get-together with the overseas players. Those who were able to make it: Hasebe, Kawashima, Nagatomo, Miyaichi, Kagawa, Hosogai, Morimoto, Yoshida, and Uchida. Click on photo for full album. The next couple months are still going to be full of activity, as many members will have to deal with possible transfer deals, and some are already set to join new clubs. Leverkusen has taken Hosogai back from Augsburg for this upcoming season, and it will be a critical season in his footballing career. Kawashima is looking to find a new home in Italy or England, but openings for goalies, and in particular non-native goalies are quite rare. Of course, Kagawa's imminent move to Manchester United will keep media in both countries busy through the summer. And there is some rumor that Morimoto is desperate to find a new club, including possible choices in the J-league. The Olympics squad's provisional list of 35 was announced this week -- notable were the inclusion of Miyaichi and Kiyotake, the exclusion of Kagawa, and the possible use of Yoshida in the OverAge category. Yoshida, who injured his knee during the Jordan game, vowed to be healed and ready if or when he is called. The next scheduled game for Samurai Blue is a friendly against Venezuela in Sapporo, August 15. The Olympics squad will have a pre-London warm-up game against New Zealand on July 11 in Tokyo. The clash between Japan and Australia last week was certainly a highlight that capped an interesting 10 day period of World Cup Qualifiers. It had all the rivalry, pedigree and drama that colors memorable games -- and in these internet-reliant times, launches thousands of blog entries and tweets. Needless to say, "Khalil Ibrahim Al #Ghamdi" was trending that night. If you watched the game, you know why. His judging of what was in itself an entertaining battle between two Asian forces distracted focus and devalued the game. Though everyone had their two cents to voice about how something needed to be done about Asian refs, my verdict is that he as an individual should never be allowed to call competitive events. He goes far beyond "inept" into "actively damaging" territory. I shudder in horror at the thought that this man earns his living as a teacher. He used his whistle like an abusive educator uses a heavy wooden ruler, with a misguided notion that penalizing players would help him gain authority or respect. So busy was he with his whistle, he had been surprised to be informed by his colleagues that the yellow card to Milligan 11 minutes into the second half was in fact the second shown to the player. I won't even get into the other calls, except to say that Al Ghamdi looked intimidated in his role and completely out-of-depth. And I wish the media would just come out and say "wrong" call instead of "controversial". It's not controversial if everyone knows it was wrong. On the very surface, the media built up the match as one not to miss (and rightly so). The Rivalry was a definite theme latched on to by both nations' media. But turn a page, and the pitch at Brisbane's Suncorp Stadium was a stage for two very different stories. Less than 24 hours before the game, Socceroos captain Lucas Neill tweeted "Japan favourites, in form and full of confidence. I'm happy with the underdog tag. Brings out the best in us.." He repeated these sentiments at the press conference as well, as if to deflect the mounting pressure the media was placing on the team and its aging roster, particularly after witnessing Japan's 6-0 undoing of Jordan. Many were dismissing them as anachronistic, lacking a clearly defined style, disappointed by the goalless draw away in Oman just days earlier. Luckily for Australia fans, the team was full of very experienced players who knew to keep their eye on the main prize -- a ticket to Brazil. Neill admitted they would have taken the 1 point going in to the match. The men in blue took the stage with a completely different mindset. With two years to go until WC2014, Japan is in the midst of developing what will hopefully turn into a distinct Japanese style. It is a theme with which the national team had continued to painfully struggle under previous coaches like Zico, Osim, and Okada. Though the ticket to Brazil is obviously a priority for the team in the short term, ultimately the squad's gaze is directed further -- past the group stages into the final eight or higher. Japanese players all voiced their intention to fight for the full 3 points from Osiek's men. This was not only to sit comfortably in the group table, but also as an individual milestone set in their developmental journey. It was a heart-thumping effort by both teams, each playing to their strength. We had everything from strong breaks by Australia, superb saves, shots bouncing off frames, a last-second clearance, beautiful variety of corners and short corners, a Marseille-roulette by Honda, sigh-inducing chances, and the integrity of two teams who truly want to play well. After the game, Shinji Kagawa summarized the players' feelings by saying it was a game really worth playing -- a game he really got something out of. Other Japan members have also mentioned they were really starting to enjoy their football as well. |Referee blows the whistle to end the game, forcing Honda and his teammates to raise their arms in question and disbelief. A mother watching the game with her little son tweeted: "My son just turned to me and asked if this game was To Be Continued next week..."
Yes, adorable. And a little sad to imagine the little boy spent the next few days wondering what happened to that last free kick. Snatched out from under our noses like Lucy jerking the ball away from Charlie Brown. Who doesn't like a good cliff-hanger at the end of a television drama's season? 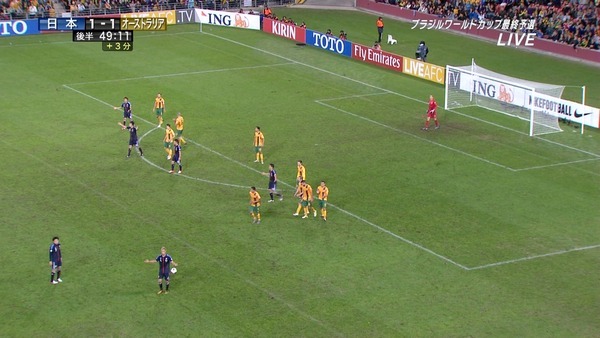 This Australia game resulted in the highest television ratings average so far for 2012 in Japan, with a 35% share. At the moment of the final whistle, the ratings had climbed to a momentary peak of 45%. Both teams were studies in contrast as they meandered towards each other to exchange handshakes. Cahill trotted over to a still nonplussed Honda to exchange jerseys. And while the relief emanating from Osiek's features and his emotional words of pride at his team illustrated just how worried they had been going into the game, you could see the members of the Samurai's gazes already preoccupied, mentally reviewing the game and coming to terms with the result. This game came at the perfect time and place for Zaccheroni. A difficult away game, the third and last in a series, an experienced and tough opponent who knew how to use a simple aerial approach, awful pitch conditions and a ridiculous referee. Thanks to the bouquet of yellows Japan received, the roster is dripping with cards, and this will give (force?) Japan the much-needed opportunity to really put the bench to the test. And let's not forget the power of a strong bench, especially during big tournaments. One of Japan's biggest strengths is the incredible team culture, and the ability of the non-starting players to keep their motivation and momentum high while prepping themselves both mentally and physically for a sudden appearance during any long-haul schedules. A full analysis has to be done on what can be done about the back line, given that any World Cup opponent bent on capitalizing on Japan's weakness will utilize the same strategy. Though the little boy may have had the wrong idea when he asked if the game would continue next week, the theme of To Be Continued does seem poetic and appropriate. On June 17, 2009, Japan played Australia away in the second leg of the World Cup Final Qualifying round. The Samurai Blue had already drawn at home against the Asian newcomers in the first leg, and by the time the final whistle blew in Melbourne, Japan supporters were not only treated to a 1-2 loss but were also forced to endure the cut from an opening salvo by Socceroos supporters -- "Nippon: Forever in Our Shadow". It was strange at the time to witness this as a Japan fan. We had by now gotten accustomed to angry booing and anti-Japan banners from neighbors in China and Korea. Needless to say, the politically-bent motivation behind a lot of the bad blood felt...well, irritating and distracting. The spectators who came to these games for the sole purpose of demonstrating against Japan were missing the point, were missing out on the real fun of the game, the chance to improve the level of Football in this continent. I wrote an article about it after the East Asian (EAFF) Cup final back in 2005 (to read a copy of it, click here). "What had we done to be insulted by Australia?" might have been an understandable initial reaction. But after a little time, it started to sink in. Oohh, I see. This is what it's like to be in a pure footballing rivalry. No politics, just football history -- sure, some of it was heartbreaking history, but that's part of the drama we love so much. With a recent history like this, all full-on matches with no friendlies to speak of, it is only natural for a rivalry to grow -- one with pride in our own and a certain degree of respect for the other. My friend John Duerden just wrote a great article about it on Fox Sports today, and it reminded me of that moment. The banner displayed by the Aussie fans back in 2009 still remains in our memory -- so clear, and easy to understand for Japanese supporters even with a high school level English, and so very purely football. In fact, I know for a fact that the Ultras Nippon members are currently trying to work out a good banner to display in Brisbane for tomorrow's game -- trying to find an appropriate and elegant comeback for that giant yellow message. Reading their tweets of ideas, you get a sense of their enjoyment of the rivalry, how they are relishing the upcoming battle they will do Down Under. What makes it even more enjoyable is the mix of J-league based players that have been called to the Australian team. One Samurai superfan heading to Brisbane, who is also a dedicated Sapporo supporter, was devastated when he realized he had forgotten to pack a sign and the Sapporo jersey he had prepared to wave at Consadole defender Jade North. And of course the four other J-leaguers listed on the roster are no slouches either. Probably the most famous in Japan is Josh Kennedy, who has shown time and again what a class act he is at Nagoya Grampus. The Australian team has been undergoing some transformation recently with the addition of these Japan-based players. Their moves to Japan clubs have added technique and creativity to the Australia game, resulting in a more three-dimensional style that mixes power and athleticism with skill and style. And let's not forget how familiar Coach Osieｃk　is with the Japanese style and mindset, having two seasons managing at Urawa Reds under his belt. According to Australian news sources, the Australian team are confident about their physical prowess and advantage over the smaller Japan side. Some Japan papers are reporting that Australia may plan to attack on Nagatomo's side -- utilizing Kennedy's towering height to get long feeds past the InterMilan sideback. There is speculation over whether Alberto Zaccheroni will replace the very-in-form Maeda with the supertall Mike Havenaar to compensate for height. Or whether Uchida will be replaced by the younger and less-experienced but faster and physically stronger Hiroki Sakai on the right. The countdown has begun. I hope it turns into the best of games. Watching the Euros this weekend has been eye-opening and inspiring, and if there ever was a chance to see a good game in these Asia qualifiers, this would be one. So far the two previous broadcasts of the games against Oman and Jordan broke the tv ratings record for all television programming broadcast so far in 2012. The Oman game received a 30% average while the Jordan game had 31%. Though I couldn't help smiling when I heard Keisuke Honda's reaction to this news: 30% means only 1 in 3 people in Japan watched the game -- that's not that high. Australia coach Osieck's irritation at the relatively disadvantageous scheduling of these final qualifying games for the Socceroos is not entirely unreasonable as Japan (the away team) arrived in Brisbane before their hosts did. Australia drew 0-0 against Oman at Manama on Friday, and according to reports the temperature climbed as high as 41 degrees during the game. The Japan squad was met at the airport on the 9th by many local fans (there are a lot of Japanese people living in Australia), and the players took a few minutes to take pics and give autographs. The flight they flew was a chartered one, the first under Zaccheroni. It's interesting to see that the Aussie squad lists about 5 players who currently play in the J-league. And of course, their coach has experience with Urawa Reds for two seasons. Kiyotake's imminent move to Nurnberg will move him into the "European" category of the squad listings. This week German papers reported talks were almost complete for Hiroki Sakai's　transfer to Hannover. Both Kiyotake and H.Sakai are currently with the National team for the June 12 game against Australia. In addition, 2nd division Bochum is said to be reaching agreement with Frankfurt for Japanese Takashi Inui (the one they call "little Kagawa"). Bayern's Usami will be playing at Hoffenheim next season. He made a little splash at Toulon last month, but if he gets called for the Olympic squad it's a really great place to show his stuff in the international spotlight. That is, if he can really keep his condition up. He's in Hawaii now for personal training and relaxation. So...uhhh...how many are in Germany now? Can't keep track anymore. For those of you who have no access to watching Japan games, I put together a little timeline collection of videos. Even before the team appeared on the pitch for pre-game warm-up, Yoshida and Uchida have been coming out to hang out and take in the atmosphere. Not really all that exciting, but kind of like watching pandas at the zoo. Oh, and you can also see the sprinklers going at full blast -- luckily Saitama stadium has an environmentally friendly water collection/storage/drainage system. The squad as they get themselves collected and pumped, waiting for that familiar Fifa anthem to herald them into the arena. This is the best edit of the game highlights I found -- showing how each of the chances were built from the defense-->attack. As you can see, it was not without the usual surprises -- an early 2-0 lead by Japan by the 20th min, a red card to Jordan (which I thought was a little harsh and personally would have preferred to see a full 90 min 11-on-11 game), an injury to Yoshida (who left the team to seek treatment for a pretty bad knee injury), Hasebe with his bandaged head, a hat-trick by Honda, a first-time goal for substitute centerback Kurihara. If the Oman game could be described in one word as Thorough, then this game against Jordan may have to be called Relentless. Aside from the first 5-10 mins of the second half, Japan were pretty much shutting down anything Jordan had to offer. It allowed Japan to control the game and keep Jordan on the back foot. Even before the Jordanians were down a player, they were struggling to get anything done going forward, and scrambling to keep track of who and where they needed to mark in defense. Despite the unbelievable scoreline at Half-time, Jordan did come back with a bounce in their step, and for the first ten minutes of the second half, really gave Japan a few scares via some strong mid-range shots and headers -- ie., playing more like we expect them to play. Japan, with the 4 goal lead had taken their foot off the gas a little, but Maeda's persistence inside the box invited a penalty, and that took a lot of the wind out of Jordan's sails. Personal use camera technology has come a long way since the days when I had to manually wind the film to the next shot -- this footage from a video camera held by a supporter shows all six goals from the perspective of those in the stands... it's actually really very well shot given all the excitement. And you get to see a version of the game that you couldn't witness via tv broadcast! I am grateful that the Euros started right after this 6-0 Jordan game. It keeps things in perspective. Hasebe shared in his blog that he watched the opening Euro game after returning to the hotel on Friday night, and he briefly touched on the fact that these were the types of opponents that the Japan team were eventually going to have to defeat to make any mark in the world. Keeps our feet on the ground. I am not grateful for the 3:30 a.m. game broadcast..... no... sleep.